A leading supplier of betting shop software in Ireland and now rapidly expanding in the UK. The next generation betting epos. Arkle is a next generation betting epos, acceptance, and settling solution for your betting shop. 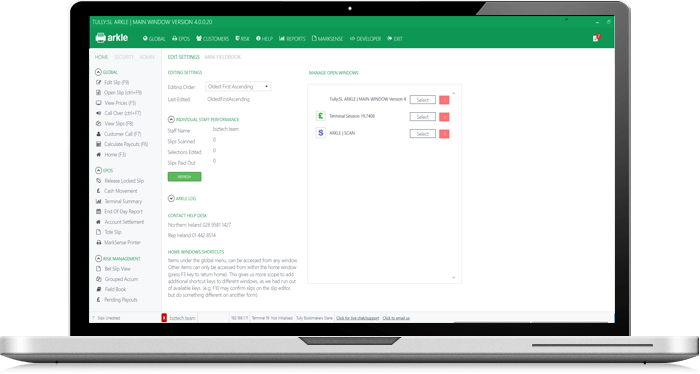 It is designed to secure and streamline your betting shop, and take care of all your needs - from bet acceptance, security, to reporting and tax returns. Arkle is built on modern .NET 4.5 Framework Technologies and SQL Server. Cut Costs - Edit bets from any computer, even when off site. Real time security alerts allow you to take action before expensive payouts are processed. ArklePOS is already the fastest bet slip editor on the market. It's ability to remote edit between shops spreads load across the bookmakers estate, this saving on staff costs while increasing customer service. ArklePOS will keep trading even when a shop's server is down, meaning bookmakers can still serve their customers and scan bets. No other system on the market can achieve this high level of resilience. Fast Marksense processing. Full suit of mark sense coupons, across all sports. All your customers to place bets direct into tote pools via tills, including placepots and scoop 6. Allows your customers to send bets on the go from their mobile direct to your shop or head office. Horse Racing all in one - includes jockey silks, fully customisable. Includes all SIS & Turf data, and virtual content. Price Providers (Toals, Bar One Racing, Super Soccer, Bet Byrne). In shop debit / credit account betting, without a full call center. Managing your estate-wide running liabilities from head office. Allows customer to call over a bet which staff can directly input into the system, and the customer receives a receipt with potential returns..
A dedicated support team provide shop assistance via Teamviewer, phone, email, and live chat. Biztech has customers spread all across the UK and Ireland, and caters to both small and large estates.